Aier Eye Hospital executives form the company logo at a recent national conference. Dr. Ming Wang Looks to Expand Aier Eye Hospitals to U.S. 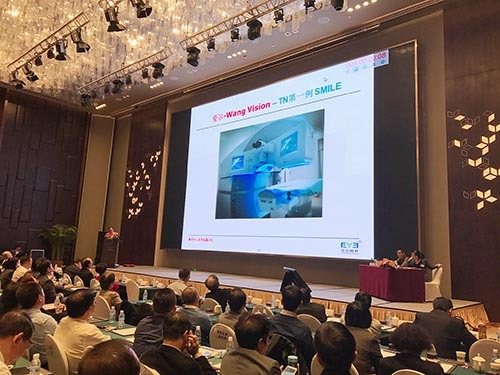 When Aier Eye Hospital Group Chairman and Founder Chen Bang approached Wang about working with the company, he was seeking a top ophthalmologist with ties to the United States who could bring the latest technologies over to China and help train Aier physicians in these new techniques. In addition to the required skill set, Wang was a perfect match for the businessman's other two key criteria: the U.S. eye surgeon must speak fluent Chinese and be from mainland China. Wang, who immigrated to the United States at the age of 21, laughingly noted that narrowed the candidate pool down considerably. The collaboration has worked well. Today, Aier Eye Hospital has grown from a small company with several facilities in rural areas of China to a publicly traded company with 154 hospitals and more than 25,000 employees. "The annual surgical volume is 500,000 eyes," said Wang, adding the average is roughly 3,000 to 3,500 eye procedures per hospital per year. In terms of facility size, Wang explained the eye hospitals fall in between the American concept of a small community hospital and a large clinic. The company announced its IPO in 2009 while Wang was with then-Governor Phil Bredesen on a Tennessee trade mission to China. Today, Aier has about 10 percent of the entire Chinese eye care market, making it the largest non-government eye hospital group in China. Of the 154 facilities, all but two are on the mainland. Wang said there is one in Hong Kong ... and the other is the Wang Vision Institute in Nashville. "Overall, the U.S. market has not been a focus for the Aier Group," said Wang. "Its focus is in China because it wants to build 1,000 eye hospitals in the next three to five years - very ambitious." Almost from the beginning of his association with Aier, however, Wang has worked to convince the company to expand in America. "As someone from the U.S., I wanted them to invest in the U.S.," said Wang, who also is president of the Tennessee Chinese Chamber of Commerce. Wearing his chamber hat, Wang noted, "Our mission is to help America with its trade with China. We have a $380 billion annual trade deficit with China." Wang pointed out the deficit with China makes up almost two-thirds of the nation's total worldwide trade deficit. He added there are two ways to offset that deficit - sell more to China or get Chinese companies to invest more in America. It's the latter tactic he has proposed to Aier for years. Recently, the company announced they would, indeed, open Aier-USA, naming Wang to lead the American division. "We take Chinese money, invest in this country and create jobs here ... I think it's wonderful," said Wang. While the financial investment in America is important to Wang, he said there is a clinical need, as well. "We actually do have a need to provide better care to American citizens," he stated, citing a lack of access to specialty care and new technology in many communities outside of major urban areas. "Our initial intent is to follow the winning strategy of Aier Hospital in its early days, which is staritng with medium to small cities," Wang said of the plan for North America. He added the company would look both at building new clinics and partnering with existing facilities. "Secondarily, we will look also at major metropolitan areas, but those will mostly be merger and acquisition to make existing clinics more efficient," he continued. Wang said 2017 has been earmarked for due diligence with new Aier facilities probably not coming online before 2018. He noted the company is starting with a primary focus on Middle Tennessee but added East and West Tennessee are also on the radar. After expanding close to home, Wang said the second stage would be to look at potential sites in the rest of the country. Wang will continue his private practice and will look to train new physicians as Aier-USA grows. Encouraging Chinese investment in the United States and creating new jobs for the American workforce are two ways Wang said he could have some small impact on the nation that has given him so much. "I'm very grateful to America," he said. "America has a system that's fair, open and gives opportunities. I feel there is an obligation for every single immigrant to give back."